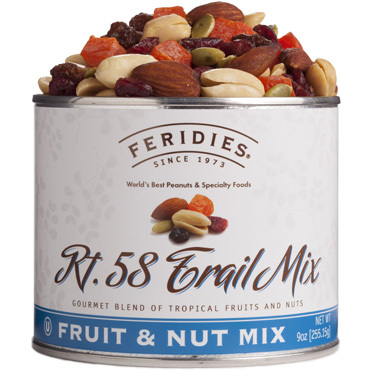 FERIDIES snack mixes were carefully crafted by Chef Ted and are made of the finest ingredients for your eating pleasure. We offer a wide variety of trail mixes and party mixes to satisfy your sweet, savory or spicy cravings. Trail mix may have originated as a hiking snack to keep active individuals well fueled during their explorations of challenging terrain, but now people of all ages and lifestyles enjoy it as a healthy treat. Eating real foods for snacks, such as the Virginia peanuts, dried fruits, and other delicious ingredients, provides you with lasting energy to power through your favorite activities or sports. Even when you're just reclining on the couch to recover after a challenging day, trail mix offers more nutritional value than alternatives like potato chips and candy. The best snack mix fits both your personal tastes and your lifestyle. That's why we offer so many different types of trail mix here at FERIDIES. We know that each customer is unique, but we're confident that there's something for everyone from among our selection of mixes. Lovers of savory snacks can nibble on fresh nuts, crisp crackers, and spicy pretzels to sate their appetites in between meals. For those who prefer the sweeter side of things, chocolate coated peanuts, soft and sweet fruits, and yogurt drops round out each selection. 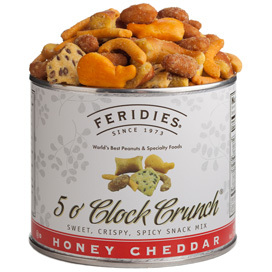 Even the pickiest eater can find something they like in the FERIDIES snack mix list. Our Chocolate Mania trail mix is particularly popular among chocolate lovers who just can't get enough cocoa. Almonds, cashews, Virginia Peanuts, pretzel balls, and raisins are all covered in either milk or dark chocolate, and yogurt-covered cranberries are sprinkled in for a hint of tartness. For a classic blend of sweet and salty, stick to the RT 58 blend. Pumpkin seeds and almonds mingle with plump peanuts and various dried fruits for long lasting energy. Consider mixing it up entirely with one of our signature savory snack mix blends for your next party. 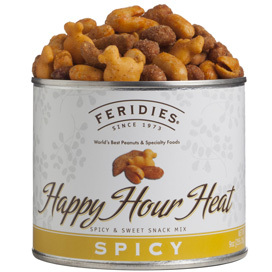 The spicy taste and golden hue of our Happy Hour Heat mix makes it an appealing finger food for any kind of gathering. Cheese crackers, spicy peanuts, honey roasted nuts and sesame sticks are all well-represented here. No matter which snack mix you choose, you'll receive only the freshest snacks directly to your door. Every order is packaged securely to prevent spills and spoilage, and many snack mixes with chocolate or candy don't ship during the hottest parts of the year. All of our trail mixes are Kosher certified.